The new kits have been designed due to the rising demand for industrial related projects in the latest months. An important automotive company has recently deployed a 300-nodes network to control gas and electricity meters in their facilities to monitor consumptions. This project allows the tenants to turn their outdated meters into smart meters, improving their inner processes with a better and quicker information acquiring process. 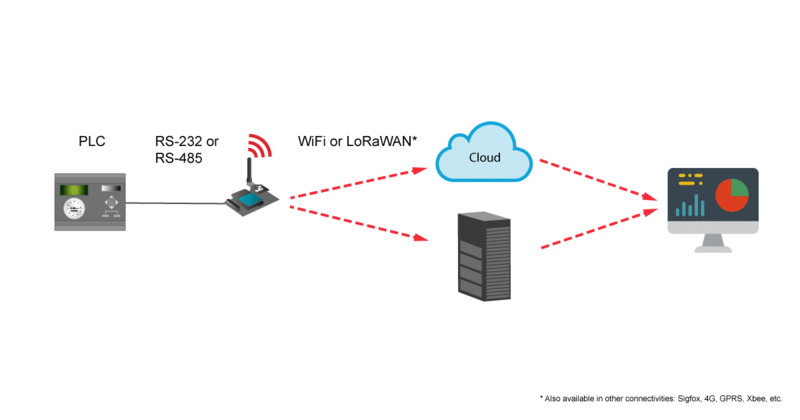 Waspmote can be configured to read the information coming from the bus and send it via wireless directly to the cloud or server using LoRaWAN, WiFi, GPRS, 4G and many more radio interfaces. These kits allow to take data from the PLC, meters, or industrial machinery thanks to Waspmote platform and send it via LoRaWAN or WiFito the cloud or to the server without interfering in SCADA. Four different models have been created with the aim to cover the widest range of applications, reinforcing the interoperability and flexibility of the Waspmote OEM line. These ready-to-deploy kits can also use any of the communication protocols in the catalogue (Sigfox, 4G, GPRS, Xbee, etc.). These kits can be customized in OEM or Plug & Sense! depending on the necessities of any project. If you were interested in a different configuration, please contact our Sales Department.